This is a fantastic bundle of 50 individually wrapped delicious snack bars. 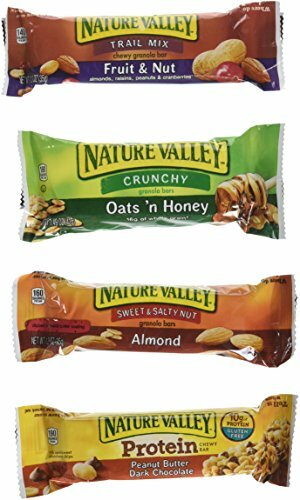 10 each of the following: Nature Valley Protein, Nature Valley Fruit & Nut, Nature Valley Almond, Nature Valley Peanut, Nature Valley Oats & Honey. This is a wonderful assortment of some of the most popular granola bars available. Sports Teams, Co-Workers, Military, Students, Dorm Rooms. Kind 18082 Healthy Grains Bar44; Dark Chocolate Chunk44; 1.2 oz.